What Does Public Education Have Against Black Teachers? You may think this is an exaggeration, but an analysis of the data from Journey 4 Justice Alliance and the #WeChoose Coalition, shows that in at least six major cities, Black teachers are becoming extinct. The same data shows us that each of these cities has a growing population of students of color, but many of them will not see a teacher who looks likes them. Instead, they will face discriminatory discipline and gaps in opportunities and attainment that negatively impact their future. From a 3% gap in Oakland to a 30% gap in Pittsburgh, Black students are attending schools increasingly taught by white educators (The Purge of Black Teachers Cities, 2019). This gap is even larger in charter schools that tend to serve more black students and hire fewer black teachers. Both New York City and Chicago have seen gaps of 38% and 39% respectively, between the population of black students and the number of black teachers within the charter school system (The Purge of Black Teachers Cities, 2019). To understand how the decline in black teachers began, we must first look at New Orleans. After hurricane Katrina, privatizers were able to push out Black teachers and turn the school district over to charter operators. In 2004, 71% of teachers in New Orleans were Black. In 2005, all New Orleans teachers were summarily fired, a mass dismissal of 8% of Louisiana’s teachers and 24% of the state’s Black teachers. (The Purge of Black Teachers, 2019). By 2013, only 35% of new hire teachers were Black, and only 22% of dismissed teachers were rehired, down from 33% in 2007 (The Purge of Black Teachers, 2019). Nationally, we have seen a decline of Black teachers to 6%, while Black students make up 15 % of the student population, and students of color account for more than half of the student population (The Purge of Black Teachers, 2019). Often the removal of Black teachers is part of a broad effort to privatize public education by turning the public schools into charter schools. With an influx of charter schools comes an increase in mostly white teachers who have less experience and are likely trained in alternative teacher certification programs. New Orleans went from having teachers with an average of 15-years of experience before hurricane Katrina, down to five years of experience post-Katrina (De-skilled and Disconnected, 2019). In 2007, Black teachers accounted for only 32% of new hires in New Orleans, and in 2013 that number increased to 35% (De-skilled and Disconnected, 2019). By contrast, 74% of the fired teachers rehired to teach in New Orleans in 2007 were Black. The majority of new hires in New Orleans since Hurricane Katrina are white even though the student population was 89% Black in 2013 (De-Skilled and Disconnected, 2019). The lack of Black teachers in schools often leads to a cultural mismatch between Black students and white teachers and administrators. As a result, Black students in New Orleans are underrepresented in gifted and talented, and AP courses and a majority attend schools that do not offer calculus or physics (De-skilled and Disconnected, 2019). Additionally, Black students in New Orleans are disproportionately retained, suspended, and expelled. We know from the research that Black teachers are more likely to identify Black students as gifted and less likely to refer them for punitive disciplinary actions. Black teachers often have higher expectations for Black students, than non-Black teachers, and we know that teacher expectations matter (De-skilled and Disconnected, 2019). Given these and other statistics, it is clear that we need more Black teachers in public education. 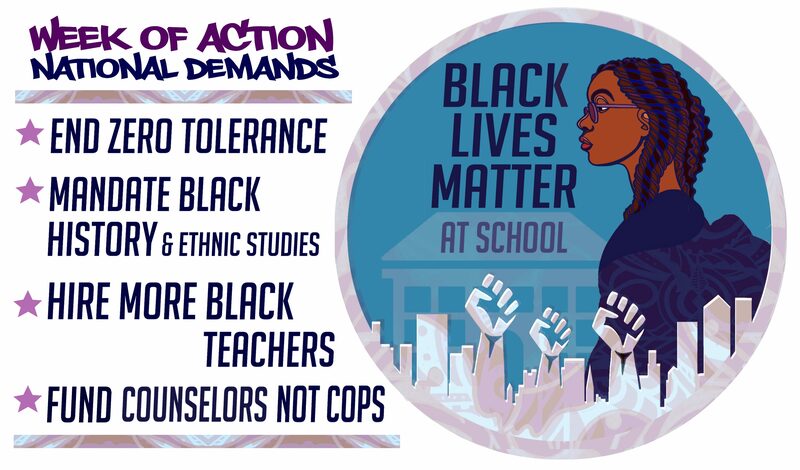 As educators and activists across the country engage in the national Black Lives Matter at School Week of Action, February 4-8, it is imperative that we address the demand for more Black teachers. Black students deserve an education steeped in a culturally rich environment that honors and uplift their sociocultural identities, and this begins with having high-quality Black educators and administrators. We, the national steering committee of the Black Lives Matter in School Week of Action, join Journey 4 Justice and the #WeChoose Coalition to call on all districts to make explicit their plans to increase the hiring and retention of Black teachers. Information for this graphic was gleaned from: The Albert Shenker Institute State of Teacher Diversity Report, the work of Ingersoll, Madkins, Gehrenson et al, Lash et al, Burras, Lincove et al, the Minneapolis Public Schools Black Teacher Survey, the USDOE Civil Rights Data Collection, the respective district and state department of education websites and various news articles.